Adding to the heap of pre-MWC goodies we've seen lately, NEC decided to show off three of their new Android-powered phones today in Japan, and if nothing else, the devices look interesting. The first thing that jumps out is the strange gizmo on the far left – it appears to have 2 displays back to back (when folded), and is labeled as the "best cloud device," hinting at easier cloud connectivity. According to The Verge, the handset also has a super powered battery to keep both displays running. Next is the "Large Screen in One-hand" phone which, as the label suggests, appears to have a luxuriously large screen. The phone also has a super-thin form factor, and a remarkably thin bezel, making it an extremely attractive device. Finally, NEC showcased the "most stylish" handset, with a "fast-activating" camera, a handy resistance to water, and, as The Verge puts it, "expandable functionality with the addition of a special jacket." It's not clear what the "jacket" may look like, or how it will function, but we can expect to find out next week. 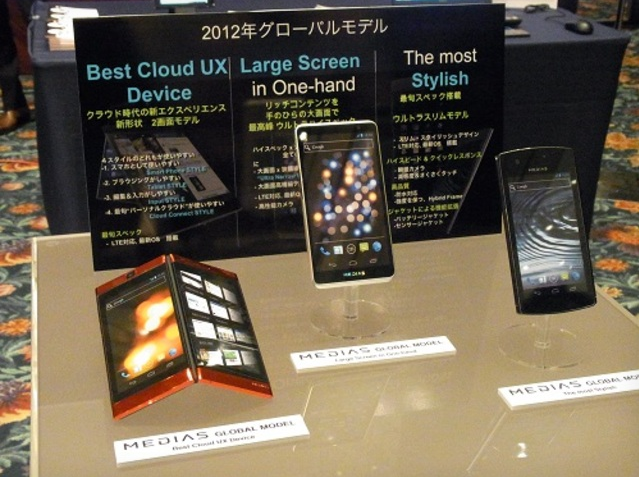 Overall, it looks like NEC has an attractive set of devices to share at MWC. Stay tuned, because we'll be covering all the details surrounding these new devices as they come out.